This being primarily a book blog, the photos are accompanied by a book list – half a dozen books set on submarines. Not a definite list, by any means; I have heard of several others well spoken off (but I haven’t got round to reading them yet). If you’d like to recommend a book on submarines that you enjoyed, please leave a comment below. Unfortunately, Dékány didn’t go into sufficient detail. The Taitsing surged ahead, running before the wind. She was a wonderful ship, with a wonderful crew. “The Implacabile!” the joyful memory bubbled up in Monostory. Yes; the lost, sunk Hungarian frigate sped like this as she charged into battle against the Austrian emperor’s corvette. In a novel that runs to more than 400 pages, Dékány only mentioned the ship’s name 13 times. This, however, didn’t prevent him to play expertly with his readers’ imagination and emotions. From the emotive half-sentences he scattered throughout the novel we created an entirely fictitious, glorious fight between the first Hungarian frigate and untold scores of Austrian warships on the bluest of all seas, the Adriatic. And so the legend of the Implacabile was born, thanks to a children’s book. On the north wall of the cabin, there was, however, one thing to arrest a visitor’s attention: you could see a ship’s flag here, spread out. The flag was rather faded with time but it was a ship’s flag – a rare object. The flag of the Implacabile, the first Hungarian Navy frigate, sunk ten years earlier and commanded by Balázs Monostory, was the only decoration in the cabin of the captain of the Taitsing. The flag, saved when the frigate sank, had accompanied Balázs Monostory for ten years. But so far he failed to realise his plan of handing it over to his leader, Lajos Kossuth, a man in exile just like the owner of the cabin himself. Gabriela Malatesta’s eyes clouded over as she looked at the flag. Red-white-green. Those same colours formed the flag of the Italian patriots. But what’s the truth – if any – behind the legend? Did the Implacabile even exist? And if she did, did she ever fight a warship of the Emperor of Austria on the Adriatic? There was once a kingdom without a king, a country without a sea – ruled by an admiral without a navy. Do you think I’m joking?! Hoy vamos a hablar de – y con – uno de mis autores favoritos. …Pisani podía oír la bulla desde el calabozo ducal. Puso la cabeza contra de las barras y gritó: «¡Viva San Marcos!» La multitud le respondió con un clamor ronco. Arriba, en la sala de los senadores, seguía el debate nervioso. La multitud puso escaleras frente de las ventanas y golpeó la puerta de la sala con una llamada rítmico: ¡Vettor Pisani! ¡Vettor Pisani! ¿Eso te parece un extracto de una novela? Es historia – en la forma que la escribió el historiador británico Roger Crowley. El extracto arriba es de Venecia: Ciudad de Fortuna, el libro de Roger Crowley sobre el auge y la caída del poder naval veneciano. Si quieres enterar por qué el almirante Pisani (1324-1380) – obviamente muy popular – se halló en la prisión del Doge y qué le pasó después, pues ya sabes qué hacer. Today we’re going to talk about – and talk with – one of my favourite authors. It’s history – as written by the British historian, Roger Crowley. The excerpt above is from City of Fortune, Roger Crowley’s book on the rise and decline of Venetian naval power. If you’d like to find out why – the clearly popular – Admiral Pisani (1324-1380) was languishing in the Doge’s prison and what happened next, you know what to do. Fui a Portugal para una semana con un libro, y volví con dos; lo nuevo está en portugués. Eso suena muy bien pero no tengas que envidiarme: no logré aprender portugués en una sola semana (echo la culpa a los portugueses, ya que insistieron en hablar conmigo en inglés). Sin embargo, he comprado un libro en portugués, y no cualquier libro, sino la más famosa obra de literatura portuguesa: el poema épico, Los lusiadas, escrito por el poeta nacional de Portugal, Luís Vaz de Camões. Aunque sólo en la forma de un libro de historietas. Todos aquí pueden confirmar que el español y el portugués son suficientemente similares para ser posible leer portugués un poquito sin aprenderlo, ¿no? Por esta razón me parece que tengo posibilidad de comprender Los lusiadas cuando el texto va acompañado con MUCHAS ilustraciones. Y un poco mejor: cuando el texto va acompañado con MUCHAS ilustraciones y ya conozco el argumento. I went to Portugal for a week with a book and came back with two; the new one is in Portuguese. This sounds grandiloquent but you needn’t turn yellow with envy: I did not manage to learn Portuguese merely in one week (I blame the Portuguese who insisted on speaking to me in English). Nevertheless, I acquired a book in Portuguese, and not just any book but the most famous piece of Portuguese literature: the epic poem The Lusiads by Portugal’s national poet, Luís Vaz de Camōes. Although only in the form of a comics book. Any Spanish speaker will testify to the fact that if you can read Spanish, you can read Portuguese to a very decent degree. Consequently I fancy my chances of making sense of The Lusiads when accompanied by LOTS of pictures. Better still: I fancy my chances of making sense of The Lusiads when accompanied by LOTS of pictures and when I already know the plot. Because the story Luís de Camões tells in The Lusiads is from the heroic age of Portuguese navigation: the journey of Vasco da Gama in 1497-98, when he became the first European to reach India by rounding the Cape of Good Hope. And the book I went to Portugal with, Conquerors: How Portugal Forged the First Global Empire by Roger Crowley, treats the same journey – and a bit more. Sometimes people have the misfortune to live in ‘interesting’ times. Exciting, even. In the case of Spain, in fact, it’s difficult to find a period of history when the times were not ‘exciting’ – so it shouldn’t come as surprise that the excitement in Cayetano Valdés’s life not ended with Trafalgar, but rather, it began. I mean you’d think there he was, sitting ashore in the naval ports of Cádiz and Cartagena, figuratively licking his wounds… having been promoted to senior officer, safely behind a desk in an office, pushing paper in the grand Spanish fashion, into quiet old age – since there wasn’t much of a navy left for him to command, right? Er, no. It was a cold and foggy day but you should have taken a look at the title perhaps. Rather than detailing Nelson’s heroics of which you can read on plenty of other websites, I’m going to write about a Spanish naval officer: Cayetano Valdés, who had been cast in the role of having to save the Santísima Trinidad, the pride of the Spanish navy, the largest warship of its time. A topic that you won’t find much discussed in English elsewhere (for entirely understandable reasons). In 1900, sponge divers discovered the wreck of an ancient Greek galley off the Aegean island of Antikythera more than fifty metres deep under the surface. As usual, the find threw up a load of questions: Where did the galley come from? Where was it going to? Why did it sink? Who were the passengers? And what is that mysterious, complex mechanism found in the wreck? The two hundred galleys of the Holy League – Venice, the Spanish Empire, Genoa, the Papacy, the Knights of St John and sundry smaller states on the Mediterranean seaboard – were sailing south on the Ionian Sea in battle order when a small brigantine passed them: a Venetian ship from Crete carrying the news that the town of Famagusta, the last stronghold of the Republic of Venice on Cyprus, fell to the Turks. The date was 4 October 1571, three days before the Battle of Lepanto. 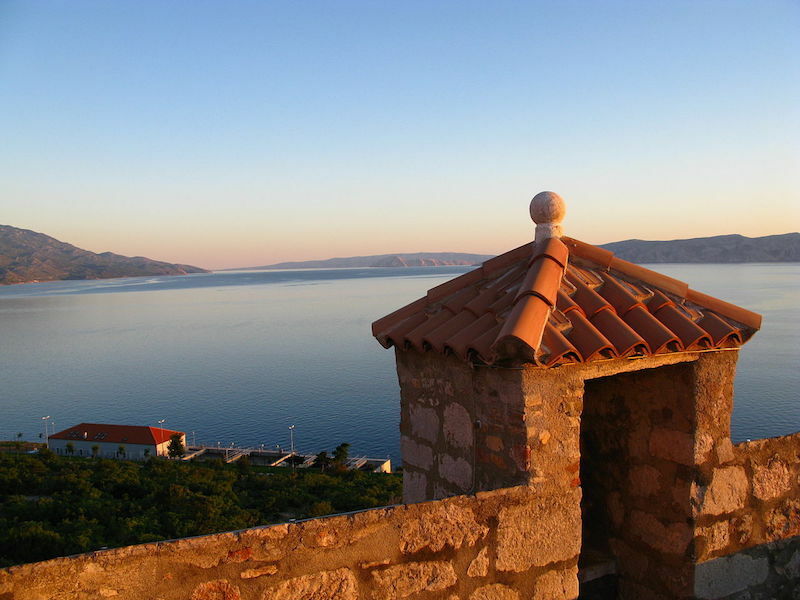 View of the Adriatic from Fortress Nehaj, Senj. Photo by: Joadl CC BY-SA 3.0 via Wikimedia Commons. A few years ago, in one of the galleries of the National Maritime Museum of Greenwich there was exhibited a life-size model of a boat trapped in pack ice, with a suitably gruesome frozen hand protruding from under frozen canvas: a striking illustration of the fate of Captain Sir John Franklin and his crew for the younger visitors. Franklin’s expedition set out in 1845 with 129 men on board of two ships to search for the North-West Passage – a route from the Atlantic into the Pacific through the islands of Northern Canada – and was never heard of again. Despite repeated search missions in the following years and decades, the exact fate of the lost expedition remained unknown until 2014 when a Canadian research team finally located one of Franklin’s ships, the HMS Erebus. On Monday morning, when I started to write this post, of course I couldn’t have imagined the news that broke in the media that same afternoon: that Franklin’s second ship, HMS Terror, has now also been found – the last piece of the puzzle falling into place? But although Franklin’s expedition is without doubt the most famous among all the attempts to navigate the North-West Passage, I wanted to write about another sailor who searched for the passage nearly three hundred years earlier and from the opposite direction: Francis Drake on the Golden Hind in 1579. For me, a good non-fiction book is not one that simply gets its facts right; it also has to read well, like a novel. (Showing my lack of sophistication here.) It helps of course if the author of the non-fiction book has a good subject to work with; and the Royal Navy in the time of the Napoleonic wars certainly makes for a good subject. The Arsenale, the ‘Forge of War’, was Venice’s naval dockyard where the Serenissima Repubblica built the fast, sleek war galleys that ran the length and width of the Mediterranean, protecting Venetian trade and interests. The only Italian city not in existence in Roman times? Anybody?